THE unseen stars of hospital radio received an accolade after 37 years of service. 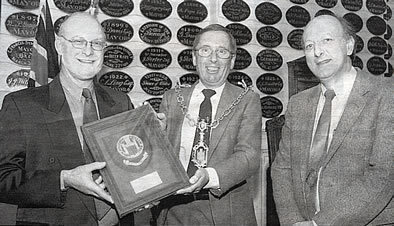 Mayor of Dorchester, Coun Trevor Jones handed over an award to Andy Venton and Andy Worth, two of the founder members of hospital radio in the town. He paid tribute to the third founder member of Ridgeway Radio, Peter Foster and his wife Heather, who are also volunteers at the station, who could not be there to receive the award. The station, which is now based at Dorset County Hospital, started off at the Conservative Club in 1966 and spawned other radio stations at the former Weymouth and District Hospital, Radio Shambles, and Radio Herrison at the former hospital.